One thing parents have asked us about recently is haircuts. Getting a haircut is a very sensory experience. Often a parent who recognizes that their child might have some sort of sensory issue talks about what a nightmare it is to get their child’s hair cut. There are a couple of ways to tolerate or deal with that process as you’re going through it, while your child is improving in their sensory processing. 1. Work through it with therapy. First, it’s important that your child is in some sort of sensory-based occupational therapy so that they can begin to get their nervous system regulated, and they’re not having that heightened fight or flight response. Remember that when your child reacts that way, they’re in a fight or flight response mode. They think the hairdresser is causing them extreme pain, and so that’s the way their body experiences it. While your child is working through the process, even though their sensory system is getting better, they’ve learned that a hairdresser is a bad place (or the dentist, or any of the people who work on our body). We have to recondition that process. 2. Make it familiar and comfortable. It’s important to find a hairdresser your child really connects with. (We have a list here in the office of people who are more sensory-friendly if you need help finding someone.) Before getting a haircut we recommend that you and your child visit the place, walk through it, and decide if that’s a place we like or we don’t like. Also, talk to the people at the salon. 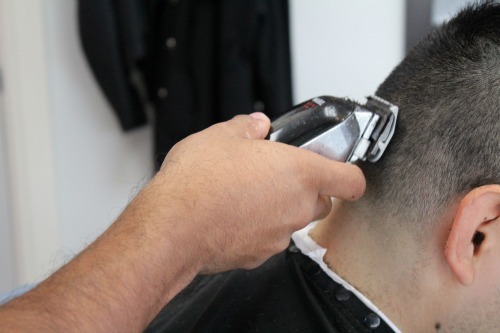 Many of them know about the problems some kids have haircuts cuts, and sensory sensitivity and they have some hairdressers that tolerate and understand that better than others. Talk to the people at the salon. Develop a social story for your child about getting their hair cut. Show them pictures of the place. Make it a very familiar place for your child. Visit it before you ever get anything done. (Just like going to the dentist—we always tell parents to visit the dentist’s office before they work on the kid’s teeth.) We want them to become comfortable in that place so that we reduce the anxiety attached to it. If your child is calmer when they watch a TV or video screen, many of the hairdressing places have those available. Look around for a place that has that kind of screen, or bring something from home that will allow them to do that. Many places have private rooms. Sometimes going to a private room takes away that overload of the busy environment inside the salon. There are even some hairdressers who will come to your home. Sometimes the comfort of being at home makes things a lot easier. I’ve had parents who had their child’s hair cut in their car seat, inside the car! Whatever works! You name it, I’ve seen it! Those are some options for getting your child’s haircut. If you have any other questions, we’re happy to talk to you about haircuts and other sensory adventures. Just give us a call!